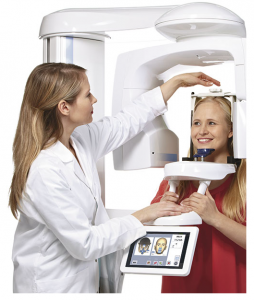 Helvetic Clinics Budapest is one of the few dental clinics in Hungary which has its own in-house 3D Scanner. In order to give proper treatment, we need to see things clearly; therefore our dentists use a 3D scanner to get an accurate and complete image before fitting a dental implant. The panoramic X-ray will only show the height of the bone, not its depth or width. So before placing an implant, we always scan your mouth. Thanks to 3D imagery, our dentists and implantologists can perform a computer simulation prior to fitting a dental implant. This gives them an accurate and complete view of the depth and width of your jaw bones, allowing them to create a guide for precise placement, including diameter, length and angle of the implant. The scan will also give a clearer view of your nerves, enabling your specialist to make the best possible decision regarding suitable methods of the placement. At Helvetic Clinics, we know that we can only treat a problem properly if we can see it accurately; this is the reason we work with 3D scanners and devices which are usually only available in medical imaging centers. 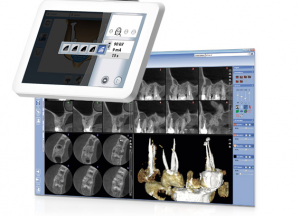 The 3D function creates a virtual, clear picture of the patient’s maxilla and mandible. This multifunctional x-ray machine provides digital panoramic and 3D pictures, as well as 3D model scans. It is the best possible system which gives a distinct view of the patient’s upper and lower jaw. In modern dentistry, when it comes to implantology, this 3D device became indispensable. It meets the requirements of surgical dentistry with its accurate and clear three-dimensional imaging with limited patient radiation dose. This top-quality device is one of the most modern 3D panoramic systems on today’s market.